Ripe, sweet, juicy local berries are a great summer treat. Since berries don't ripen after picking, choose bright, deeply colored berries that are not mushy. Berries are delicate morsels that are at their best eaten quickly after picking. Store them, if needed, covered and chilled. Rinse and pat dry just before eating or using. 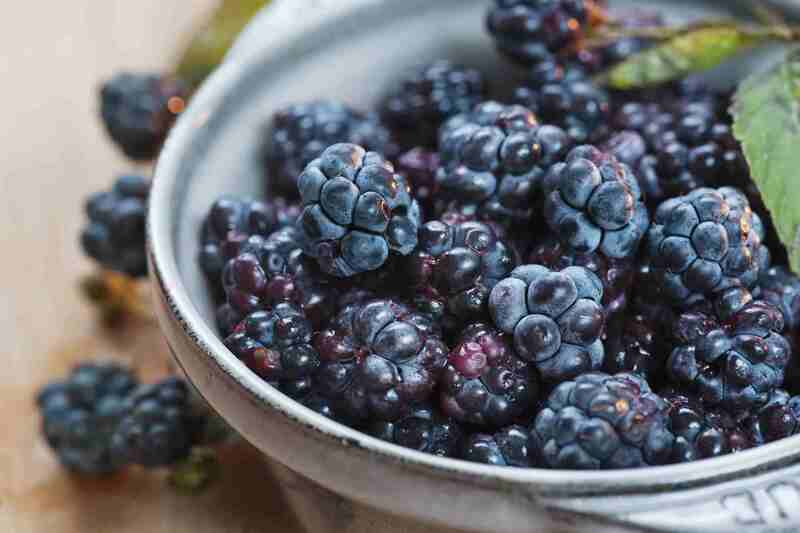 Many different berries fall into the category of blackberries, like Marionberries named after Marion County in Oregon, which are perhaps the best known. What they all share is a deep purple, almost black color and an equally deep flavor. They have a woodsy note that is particularly delicious in tarts, jams, and blackberry buttermilk cobbler. Blackberries are in season from May through July. Blueberries are plump dots of tart sweetness. Wild blueberries tend to be smaller and have a more concentrated flavor, cultivated blueberries are bigger and juicier. Watch out, however, for flavorless blueberries, which have become all too common. Luckily, most vendors at farmers markets will give you a taste of their wares before you buy. Blueberries are delicious in a pie, turnovers, shortcake, or cobblers. They can also be used to make cooling sorbet or ice cream. They make lovely additions to tossed salads, too. Blueberries are in season from June through August. Cranberries are native to North America, where they grow in bogs. Hard and tart, they are usually cooked with some amount of sugar, dried and sweetened, or used to make syrups or other preserves. Cranberries are harvested from September ​to November. Gooseberries are small pebble-like green berries with a silvery cast and a sour-tart hit. Because of their intense flavor, they are best in jams, pies, and other highly sweetened dishes. Gooseberries can also be used—like cranberries—to make sauces that go well with duck and game. Gooseberries grow in cooler but not harsh climates where they are in season from July to September. Huckleberries are teeny tiny deep purple-blue berries that are remarkably sweet. They are great with cream, sprinkled on ice cream, or used in pies, tarts, jams, and sauces. Look for huckleberries in August and September. They are most widely available in the Pacific Northwest. Raspberries have hollow cores (that's the main difference between raspberries and blackberries) and come in delicate pink to deep red to golden and even black varieties. Raspberries are perhaps the most delicate of all the berries. Look for matte berries with no bruising or crushing or anything remotely out of sorts. Once one raspberry starts to go, the rest tend to follow quickly. Since raspberries do not keep well, plan to use them quickly. Rinse berries quickly in cool water just before using and dry by laying gently on a clean towel and patting dry. Try the lightly tangy flavor of raspberries with a bit of cream and sugar or in a cobbler or in a bread pudding. Raspberries are mostly available from June to August. Salmonberries are, as you might guess, salmon-colored berries. They also have a tendency to grow near streams where salmon spawn, whether on the West Coast in British Columbia up to Alaska, or on the East Coast in Newfoundland. Salmonberries tend to be quite juicy, but can be used like blackberries or raspberries. Like other brambles, they are prolific where they grow wild. Salmonberries can be found hanging from their brambles in July and August. Saskatoon berries are a delight of local eating in many provinces of Canada. They look a lot like large blueberries, in both shape, and in their purple-to-blue color. They can be used in a wide variety of ways, including pies, jams, wines, and dried. The First Nation people of the prairies traditionally used these tart and flavorful berries as a way of preserving and adding flavor to dried meat. Like many wild berries in North America, Saskatoon berries tend to ripen in July and August. Perfectly ripe strawberries are best eaten out of hand. To jazz them up, hull them and pour heavy cream or good-quality balsamic vinegar over them. Another favorite quick treat is to dip strawberries in sour cream or plain yogurt and then into a bit of brown sugar. Strawberries are also delicious on cereal, as a shortcake, in a smoothie, or baked into strawberry ricotta muffins. Strawberries match up nicely with other berries, melons, and tropical fruits in a simple fruit salad. Strawberries from California and Florida are available all year round, but ripe, local berries are at their best during their traditional harvest season from April to July.